We here in Berlin we have been enjoying a gorgeous autumn...Littel rain lots of sunshine and may chances of enjoying the great outdoors. 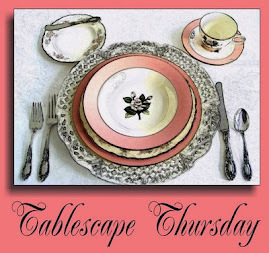 Here are two tablescapes that I recently created for our outdoor dining area. The napkins were made from some old curtain material. Found this idea on the internet...love what you can do with dried grains. The wooden charger as well as the cake stand were made from a tree we cut down a few years ago.